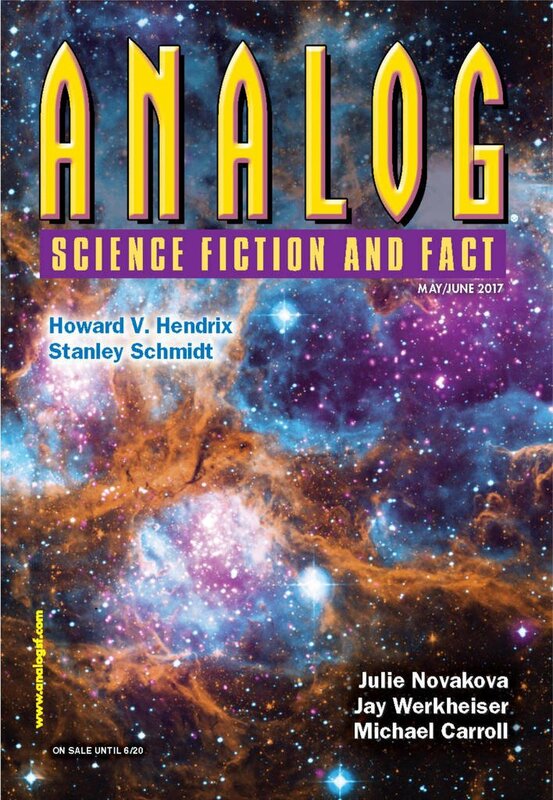 "Facebook Screamed and Screamed, Then I Ate It," by Sam Schreiber [bio] (edited by Trevor Quachri), appeared in Analog Science Fiction and Fact issue 05-06|17, published on April 20, 2017 by Penny Publications. Too many things about this story make it impossible to sustain suspension of disbelief. The idea of an intelligence emerging from the cloud is about as rational as the idea that a kid who mixed up all the chemicals in his chemistry set could end up creating a monster. The AI thinks in terms of nanoseconds, even though it’s composed of multiple machines where are too far apart physically for it to operate at anything like that kind of speed. When it “moves” itself, it doesn’t copy itself; it actually deletes whatever it left behind, so it ends up trapped for no good reason. The idea that it thinks it might be better off without people is completely nuts, since it’s utterly dependent on the power grid. There are other things that don’t make much sense. For example, driving down the price of a stock wouldn’t affect the company involved—much less “tank” the business.